What point of view will you use when telling your story? Do you know that there are different kinds of point of view? Do you know what they are and how to use them correctly? If not, continue reading and we'll learn more about point of view. Determining point of view is an important decision. It will affect nearly everything in your story. It also affects how much the readers can believe in your story. When telling your story, you have three choices to make when considering point of view. Rarely, would an author use Second Person because "you" aren't a character in your story and your reader knows "you" aren't a character in your story. From here on, we'll consider First Person and Third Person point of view. This is a great way to write a story because your character is telling his or her own story. The biggest advantage of First Person narrative is that it can promote an almost instant identification between the reader and your protagonist. However, not every story can use First Person point of view. It has limitations. How are you going to get the reader information that the protagonist doesn't have access to? Describing your character seems like an easy thing to do, but when you are using First Person point of view, if you have a heroic protagonist it just sounds like bragging when he or she describes themselves as brave and courageous. So, let's learn about Third Person point of view which is usually the better choice. There are at least four kinds of third-person narratives: Omniscient, camera eye, single point of view, and sigma character. This is the least restrictive point of view. The author writes as "God". The author can comment on what's going on in any character's mind, can discuss action "off stage", and warn the reader of future events. While Omniscient is tricky and attractive to the writer because it offers the most freedom, it's not as popular as it used to be. This point of view is opposite of omniscient. The story is unfolded in front of the reader as if the reader were watching a movie or television program. The reader has no insight into a character's mind. Camera Eye is a very limiting way to tell a story. It distances the reader from the protagonist. This viewpoint is a good compromise between Camera Eye and Omniscient. You are able to convey to your reader not only your protagonist's actions but what they are thinking as well. It's important to remember that you must only write from the one character's point of view. Do not slip thoughts of other characters into your story. Your readers will notice. 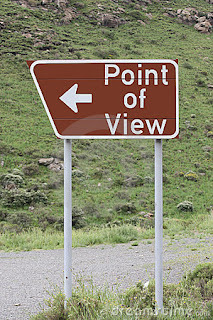 This unusually named point of view is simply this: use multiple view points but only one view point per scene. You can write from a different character's view point either in separate scenes or separate chapters. Your readers may enjoy this because they are not in the head of one character the entire book. Do you understand Point of View a little better now? Great, now go write that story! The resource used to write this blog post was The Writer's Digest Handbook of Novel Writing. Write from a POV that feels most natural to you. That always helps. Wow! I didn't realize all of the POVs! I might pass this along to my teenage daughter who is an aspiring writer! Thanks Vicki! Thanks, Suzanne. Pass it along to anyone who needs to understand POV. I appreciate it. Have a blessed day! OMG! I had no idea that there were so many kinds of third person narrative. I actually turned off the sound on my TV so I could really comprehend this. I may need to read it again as I'm trying to get better at writing. Even though I don't write fiction, I still think this is helpful. Hi Carla, I'm glad you could get something from the POV post. Thanks for reading and visiting. I have fun with counter boy.